In-between rounds of golf, President Trump is engaged in a high stakes game of chest thumping between himself and Kim Jong-un Through provocative tweets and over the top language our president is leading our foreign policy into uncertain waters. ‘Fire and fury’ evokes images of Hiroshima and Nagasaki. In 2013 the church I was serving in Oregon hosted survivors of the nuclear bomb in Hiroshima. Now elderly men and women they were children and teenagers when the bomb was dropped. Known as the ‘Hibakusha’ which literally means ‘explosion-affected people’. These survivors came to the United States in 2013 as ‘Ambassadors for Peace’. They came to tell their story with the hope that no one else would ever suffer the effects of nuclear war. 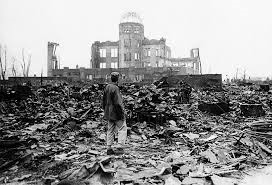 They came to bear witness to the 100,ooo who died the day the bomb dropped in Hiroshima and the 70,000 who died in Nagasaki. Mr. Trump apparently has little interest in history. Most likely he has never met a hibakusha, heard their stories, felt their pain. Rather, our president who is easily slighted, impulsive and bored by details, is leading our nation and all who live on or in proximity to the Korean peninsula, into grave danger. For the first time since World War 2, the Japanese who live along the north-west coast are taking part in air raid trainings. Yet war, particularly nuclear war, is so horrific it must be unthinkable. The answer remains with diplomatic initiatives by our nation and the neighboring nations of North and South Korea. The hard, frustrating, long term work of finding ways to live together as a global community is the only way forward. I am fearful for what will happen when two erratic, impulsive leaders, Donald Trump and Kim Jong-un are allowed to write history for the rest of us. We can’t control what North Korea does but as citizens of the United States we can try to make our voices heard. What can be done? We can hope that calmer heads prevail in the Trump administration. Thus far our president has proven resistant. Another option is to call upon Congressional leaders to move towards impeachment based upon the inability of Mr. Trump to responsibly lead. The 25th Amendment also places power within a president’s cabinet to remove a sitting president due to incapacity to lead. As a citizen I’m getting educated. A good overview can be found in this article: https://www.nytimes.com/2017/05/17/us/politics/how-the-impeachment-process-works-trump-clinton.html . Meanwhile our president tweets and rages. Lord have mercy. Well written Pastor Kent! The work of finding peaceful solutions becomes more difficult while looking for leadership among two irrational egos. Without Congressional spine, this will likely escalate to some irreversible disaster. We must demand that Congress take immediate action. We require that a sane adult provide leadership in our country. It is interesting that Trump’s childish snit happened on the 72nd anniversary of the last nuclear bombings. Larry, I’m with you. I know for you and JoAnn given your work at the Horoshima Peace Center that this is particularly personal. Grateful for all you do my friend for a more peaceful and just future. Well said Kent. I pray that the adults in the US cabinet push for diplomacy and negotiations & keep the so-called commander in chief under control. We can’t directly control the impulses of Kim and North Korean government, but I’m 200% sure that conversation is better that threats in this case…..the POTUS is essentially threatening the other nut job who already may have his finger on the trigger. Yeah, we’re bigger and tougher per Mr. Trump’s views, but does he realize the cost in human life any military action will entail? I’m afraid he’s watching too much of Game of Thrones……and I’m uncertain that he realizes this isn’t a game. So true and he’s playing with the lives of real people.